Slate floor tiles can be a gorgeous addition to a home or office. Their natural texture and coloring add warmth to your space without overpowering it. But because slate is a natural stone, you have to care for it a little differently than you might other tile options. 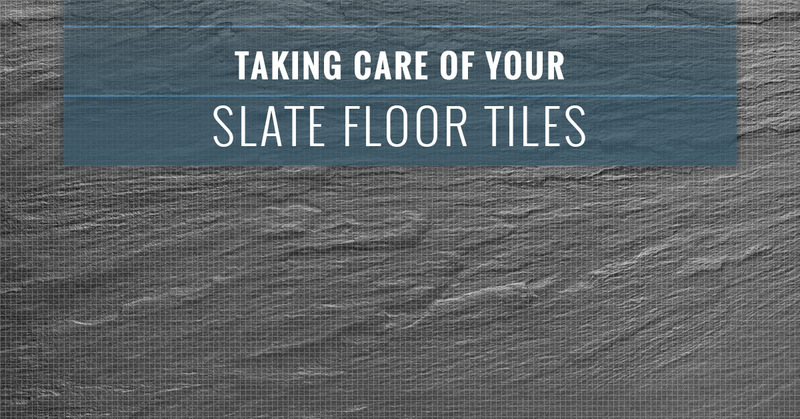 Fortunately, once you know what to do, it’s simple, and you’ll be able to keep your slate flooring look its best for years (or even decades!) to come. Here are some of our suggestions how to care for your slate tiles and some tricks to make it easier. Sweep or vacuum new slate more often. Some slate floor tiles go through a natural process when they are first laid down that’s almost like a dog shedding its fur. You might notice lots of dust and possibly even broken flakes of stone on your floor when it’s new. Don’t panic; this is natural. It’s simply the stone getting used to the new environment and settling. It’s important that you sweep or vacuum your slate floor more often when it’s new and going through this process, though. Not only will you be happier with its appearance, but the debris could end up scratching the slate and marring your new floor’s beauty. Use a neutral pH cleaning solution. The trickiest think about cleaning your slate floor is finding the right cleaning solution for it. Fortunately, the growth in popularity of slate and natural stone flooring has made this issue a lot less tricky in the last few years, because there are now a number of really good products on the market that are ideal for your slate floors. The key is to look for something that’s pH neutral; if you use anything that’s too acidic on your slate, you run the risk of the acid eating into the floor and etching it. That’s the last thing you want to happen to your new floor! Your best bet is to purchase a cleaning solution that’s been specially formulated for slate and natural stones. Wring out your mop really well. The best way to keep your slate floor clean on a daily basis is to dust mop it; this will remove the dirt and debris from the surface and keep it looking nice. But sometimes dust mopping just isn’t going to be enough. When you do need to mop, aside from using a neutral cleaning solution, you should also be mindful of how much water you use on the surface of your slate. 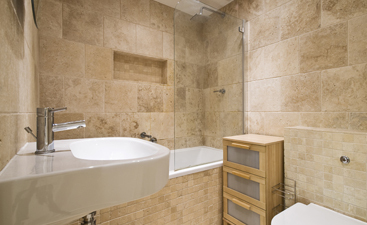 Wring your mop out really well before you use it on the tiles, and make sure that you give it plenty of time to dry. If your slate is sealed already, this is less of an issue but still a good thing to keep in mind. Use hydrogen peroxide on stains. When you need a deep cleaning solution for your slate, there is a good chance that what you need is sitting in your medicine cabinet. Hydrogen peroxide is great for slate floors. Mix it with some water, spray onto the stain and let it sit for a few minutes. If it’s a really stubborn stain, you can mix hydrogen peroxide with baking soda to make a paste, then spread it onto the stain. Let it dry, then mop up the remnants. This should take care of virtually any stain that happens to your floor. Of course, the best way to take care of stains is to prevent them from happening in the first place. Sealing your slate on an annual basis will do that for you. Slate is naturally porous, so if it isn’t sealed, any liquids that are spilled on it are going to soak into the stone. Sealing it prevents that. There are a number of floor sealers on the market, so ask our team for a recommendation or look for one that’s made for the slate. Most of them are applied either with a mop or a rag and allowed to thoroughly dry before you walk on the surface. You shouldn’t need to do this more than once a year, although high traffic areas may need it twice a year. 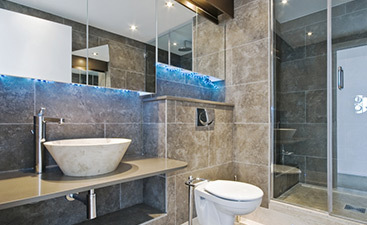 Looking for beautiful slate floor tiles for your home or office? 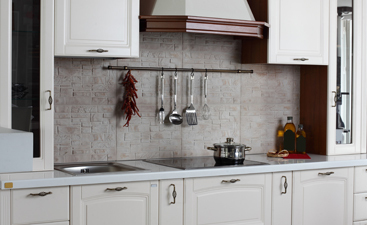 Get in touch with the Transworld Tile team today for a free consultation!